There was a time where I would put so much effort in organizing a meal with friends, endless courses, too many appetizers to recount, a tour de force which would leave my guests bloated with food and me totally drained. We get older, or we grow up and mature, if you prefer. The pleasure to share a meal is still the same, while everyone has a different reason to limit the amount of food they eat. This is when I realized I don’t need to create a Christmas menu every time. I prefer to pick up just a few seasonal dishes with lots of vegetables and I usually choose a cheese board as entree. This is the part I enjoy the most, not just the eating but especially the whole process of selecting the cheese. 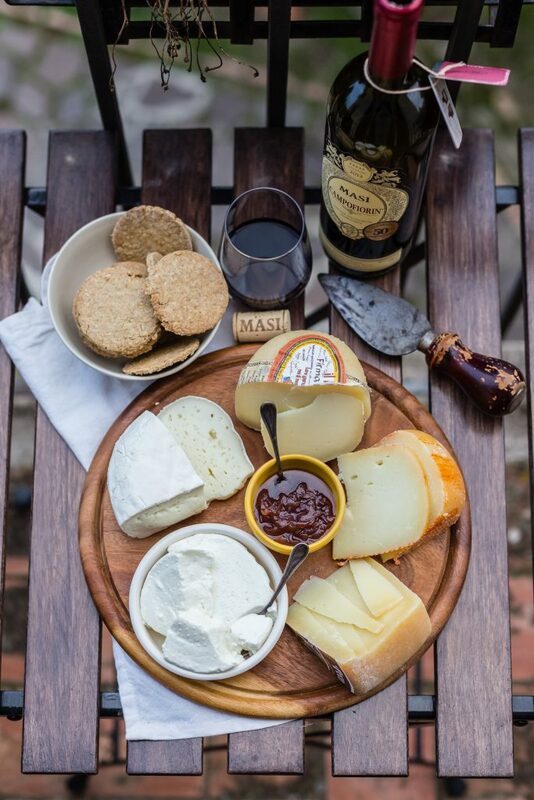 When you think about your cheese board, it is wise to choose cheeses made from different milks to suit everyone’s taste: be sure to include a cow milk cheese, a sheep milk cheese and, my favourite, a goat milk cheese. It is a sacre triad which should be respected. Consider also the age of the cheese: it is always interesting to have the chance to choose among cheeses of different textures and sharpness, from a soft and creamy fresh cheese to an old crumbly one. Add also one or two preserves, or honey, bread or breadsticks. When I visited Scotland a few years ago, I was offered oat cakes with cheese and from then on this is my choice every time I have friends over for dinner and a cheese board to be enjoyed. Those oatmeal crackers are usually made with butter or lard, while I opt for a more Italian version, made with a good extra virgin olive oil. To make these oat cakes I’ve been inspired by this, this and this recipe. Blend the rolled oats for a few seconds until coarsely ground, then dump them on a wooden board and add oat flour, salt and pepper. Drizzle with the extra virgin olive oil and start kneading. Gradually add the boiling water and knead until you have a ball of dough: it will be quite crumbly. Roll out the dough with the help of a rolling pin and a dusting of oat flour into a 3-4 mm thick sheet, then cut out of the oat cakes with a 6 cm round pastry cutter. Place carefully the oat cakes onto a baking tray lined with parchment paper and bake for about 14-15 minutes until they begin to turn golden on the edges. Let them cool down on a rack. Serve cold with a cheese platter. And here you can find a selection of some of my favourite cheese farms in Tuscany, producing goat, sheep and cow milk cheese. The cheese produced by Giovanni and Giovanna is, by far, my favourite pecorino cheese on earth, and this is an understatement. 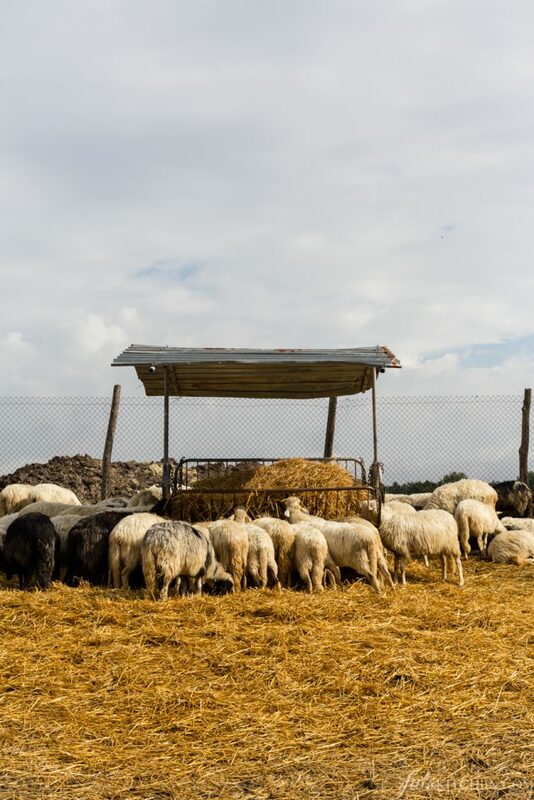 Poggio di Camporbiano is a biodynamic farm located not far from San Gimignano which produces different kinds of flours, from farro to wheat to barley, preserves, pasta, olive oil, fruit and vegetables and cheese. Their cheese is honestly outstanding, either you like the mild cow cheese or prefer the slightly sharper goat cheese. They have a soft stracchino which is creamy and lightly sour, a delicate ricotta, and the best fresh goat cheese to spread on bread. I love to eat their goat yoghurt for breakfast, too. 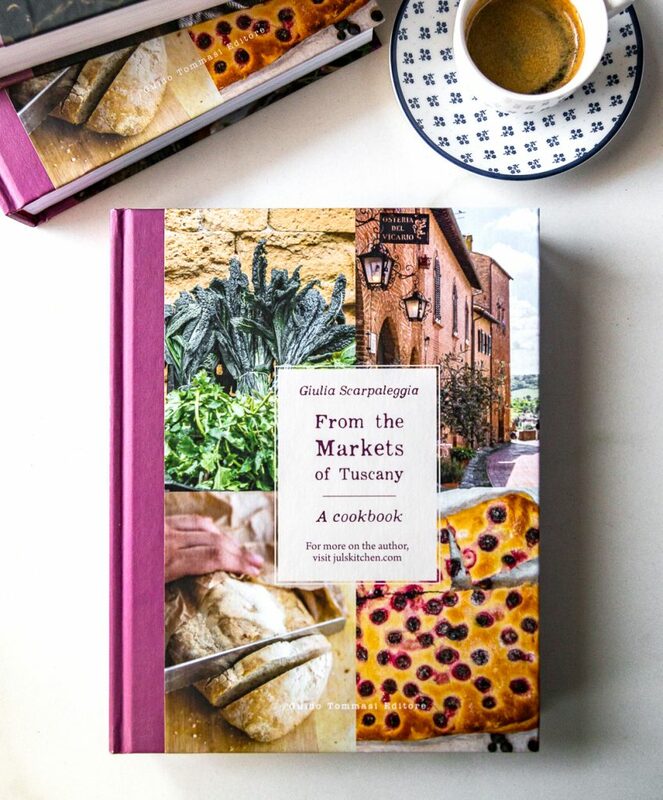 You can buy their products directly at the farm, at the local farmers’ market and, on Monday, at the farmers’ shop in Colle Val d’Elsa in Piazza Bartolomeo Scala. 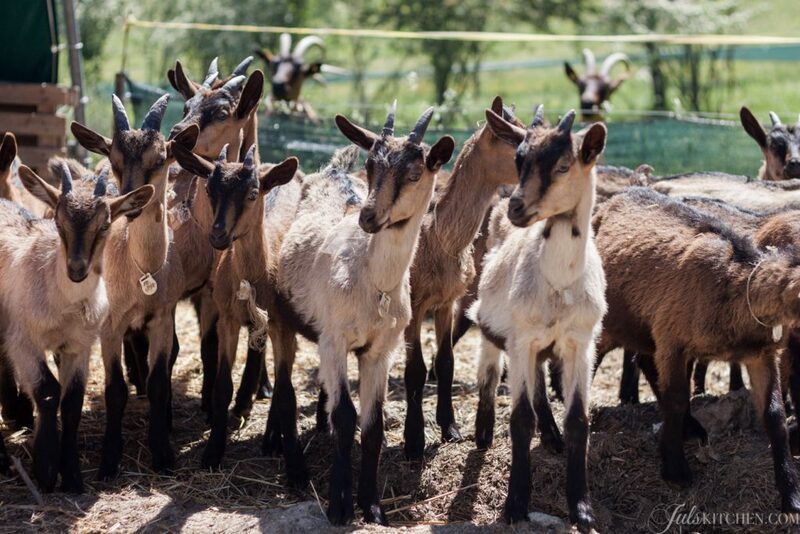 Drive a few minutes past Greve in Chianti, take a country road and you will reach Podere le Fornaci, a goat cheese farm which will welcome you with colours, joy, flowers and a hundred of goats. Everything suggests a light-hearted approach to the production of cheese. True, but this happy approach which produces some of the best cheeses I have ever tasted is also based on a profound respect for Mother Nature, her seasons, her rules and times. Learn more about the farm and its goat cheese here. 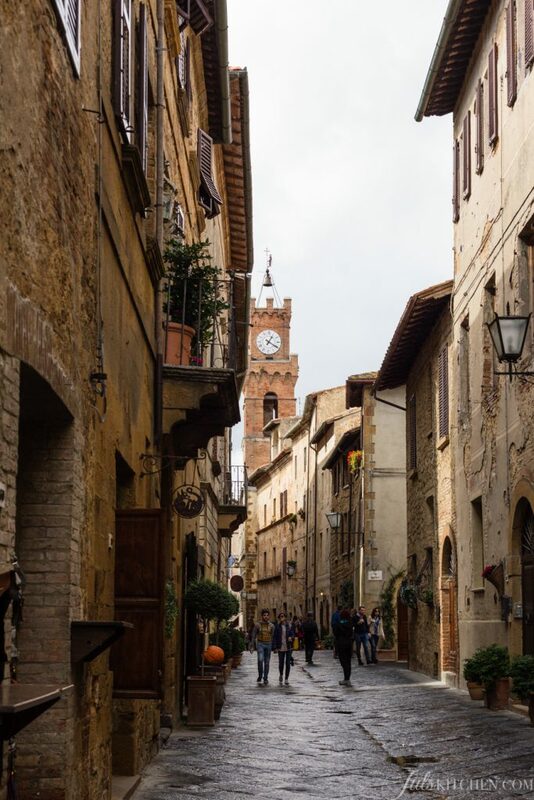 Pienza, a hill town in Val d’Orcia, is world renowned for its pecorino, a chalky cheese, which is fabulous when eaten on its own with fava beans, but also when used in cooking. 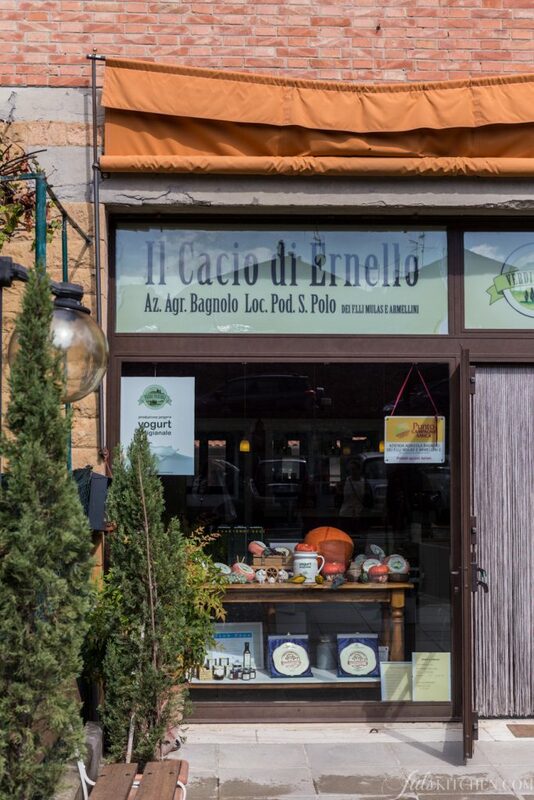 Just outside the town you’ll find a little shop where to buy a good stock of cheese at Il Cacio di Ernello. You’ll fall in love with this chalky sheep cheese which can be fresh, semi aged and aged. Try also the pecorino aged in walnut leaves. Learn more about the uniqueness of pecorino di Pienza here. Podere il Casale is an organic cheese farm run by a Swiss family on a hill in front of Pienza. 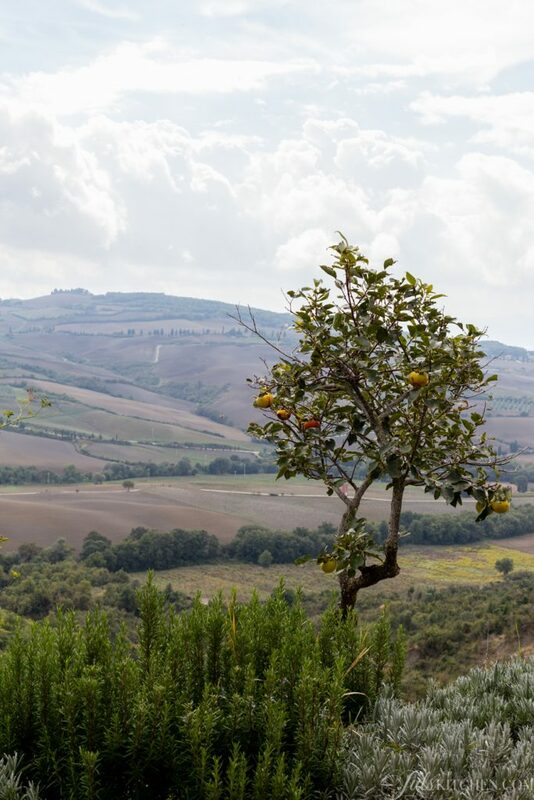 There reality welcomes you with the silver ringing of sheep and goat bells in the air, with wild artichokes growing at the side of the path, with a persimmon tree perched on a slope overlooking Valdorcia. 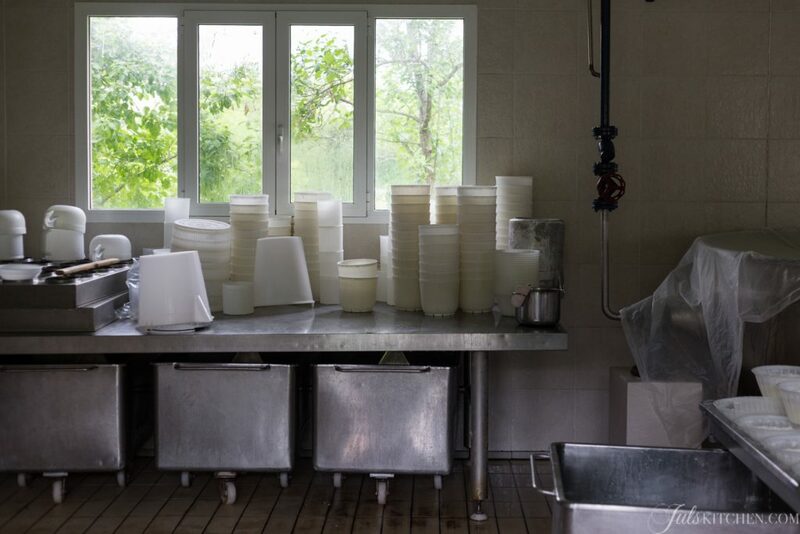 On a back road to Fivizzano you’ll stumble upon a sign for fresh ricotta. This is where you have to stop you car and get into the cheese shop of the farm Cormezzano, where they sell the cheese that they produce just with the milk of their cows. These cows are lucky animals, too, as they are raised with a mixture of cereals and beetroots, that apparently guarantees an unrivaled cheese. To open an unforgettable dinner they served us an unpretentious plate with a fresh goat milk ricotta drizzled with chestnut honey and a few slices of the local bread, made with a part of chestnut flour. All the ingredients were shining through, incredibly fresh and harmonious. I learnt to appreciate goat cheese growing up and today it is probably my favourite kind cheese. I owe this rediscovered love for goat cheese to farms like Capra Campa and to their awesome cheeses. You can buy their products directly at the farm or at the local farmers’ markets. Build the Cheese Plate of Your Dreams by Avoiding These 6 Common Mistakes. Because temperatures count and it is important not to go crazy with the pairings. How to create the perfect cheese platter. What to buy, how to serve it and what to serve it with. 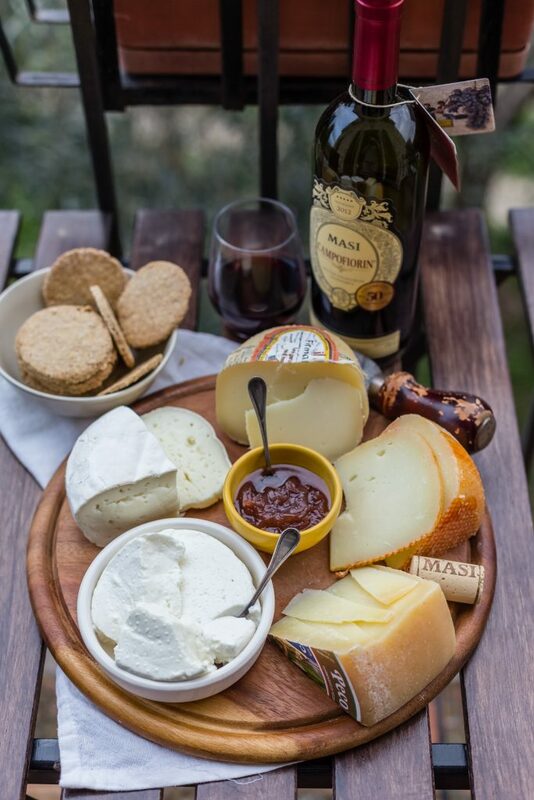 Why You Shouldn’t Pair Cheese with Wine (Plus 10 Tips for Building a Better Cheese Plate). Because the best thing to pair with cheese is more cheese. would love to find websites or store where I can but all the cheese you describe !! Ciao Giulia, wonderful to have the names of our cheese makers, and it would be so lovely if you could share the names of some favourite and specific Italian cheeses (other then for example special ones such as pecorino, grana, gorgonzola, ecc.) that you like to pair on your cheese board….the links you provided, although interesting, relate to American, Australian and British cheeses! Grazie mille! Giulia…mi devi scusare, leggendo più attentamente le informazioni sui vari produttori Toscani (il formaggio di Podere Le Fornaci e incredibile) vedo che avevi già risposto alla mia domanda! Mi sono confusa con i link! Grazie come sempre per un bellissimo blog! 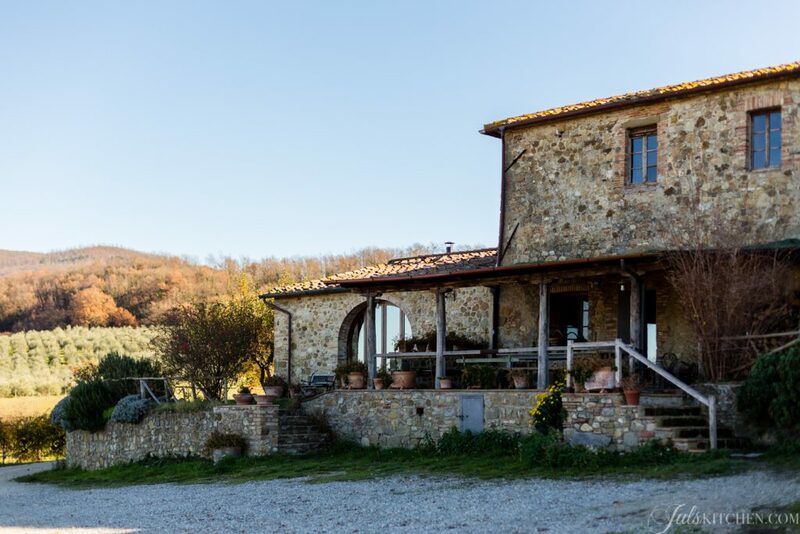 This is wonderful resource Giulia, I adore Podere Le Furnace, I went last year for the first time with Km Zero Tours and wow, that place is a real gem. I’m going to have to try these olive oil cakes soon, I’ll let you know how it goes! 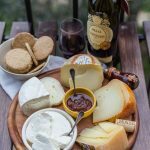 A wonderful overview of the mix of cheeses from Tuscany – terrific resource for the food traveler. Juls, do you need reservations to stop in at these cheese farms, in order to sample/taste their cheeses? Ciao Lauren, it’s better to book as in these days they might be already booked. Anyway, if you randomly pop by, I’m sure they’ll have cheese for tasting, always!